Another good early morning downhill making my way to Milling, a notorious landslide area. I know the road has been closed for over a week. I'm happy about it because it's cut the traffic in half. The landslide area is a sort of a fjord in shape. Many backpackers on Enfield motorbikes travel this way and have had to pay US$10 to have their motorbike ferried across the valley, slung under a makeshift cable car. The only other option is a 500km detour! The landslide is almost clear and cars are backed up, patiently waiting. I throw my bike on my shoulders and walk over the muddy, churned up ground. All the Indians sprint across as fast as they can. Indian workers stare up at the hills with whistles in their mouths searching for any signs of ground movement or rock falls. A lone bulldozer works but water is still gushing down the hillside making repair rather futile. I cross as fast as I can through a pack of Nepali migrant stares. The migrants recieve U$1.80 per day and have to provide their own food and accomodation from this. For them it's decent money and they send the lions share back home to their familys. 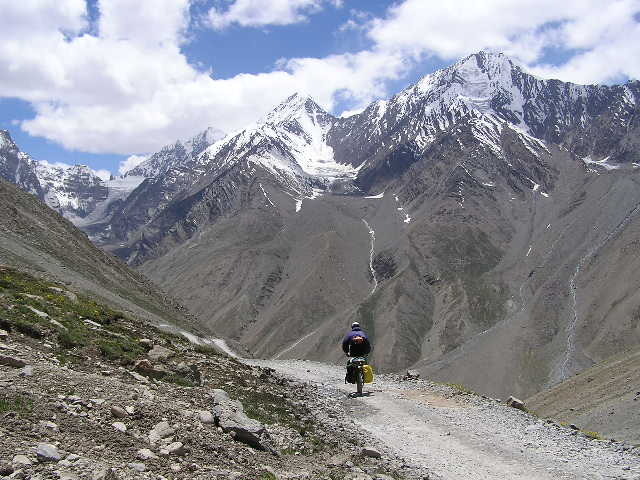 Great views on the way to Kaza. The valley is soo soo peaceful without the traffic although often a little bare. Passed through the checkpost at Sumdo and free of the restricted areas. Pushed onto Tabo, a famous monastery. Passed through several peaceful and very friendly traditional Spitian villagers. The children were great, sweetly waving as I went passed. I see the rear of a small scruffy girl playing near her house. I remember looking at her Medusa like matted hair, chuckling to myself. I give a pssst and she turned around, looked at me and waved. She had the most beautiful face and a huuuge beaming smile. I literally melted. I carried on grinning all the way. It's small things like seeing and meeting children and people that make travelling worth while! the two recent concrete hotels just out of view. 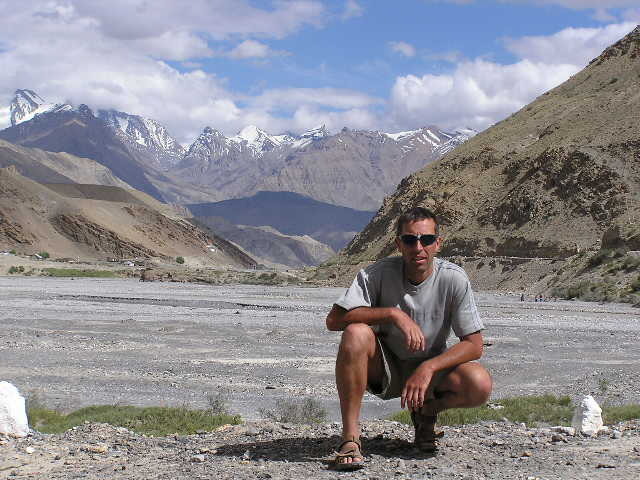 After a night in a very pleasant traditional rickety Spitian timber hotel in the small but rather touristy Tabo village I peddled onwards to Kaza, a sprawling boom town where the best thing you can do there is leave! 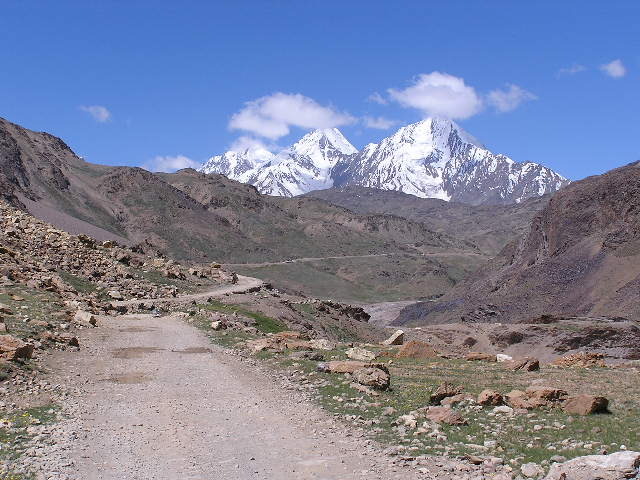 However....the route to Kaza was mindblowing. I struggled against a strong headwind, but each time I stopped for a breather I'd take in the scenery and immediately feel better. It's strange because I'd be sooo overwhealmed by the scale and grandeur of the ever changing scenery that I'd begin laughing. I was trying to understand how it could be so amazing and more to the point how come I was there enjoying it? I started thinking how my travels have changed. Before I was stuck in the bus, often surrounded by fellow foriegn tourists, whizzing past all the supereb scenery on my way to yet another toutisty town or another well trampled monument and if I was lucky I'd shoot the odd fuzzy snap out of the window. Now I'm here in my own little wilderness, like any other tourist I'm on an adventure, but now I'm either alone or talking incomprehensible sign language to some local Indian dude and loving every minute of it! In a way I feel lucky to be here and cycling such places, but I'm doing what almost anyone else can do. There's no bravery involved. In fact I feel 100% comfortable being here! A windswept Kunzum La summit. Carried onto Kibber, one of Asias highest villages at 4205m (the highest is 7km further on). Took the climb easy due to the rapid altitude gain up the switchback roads. 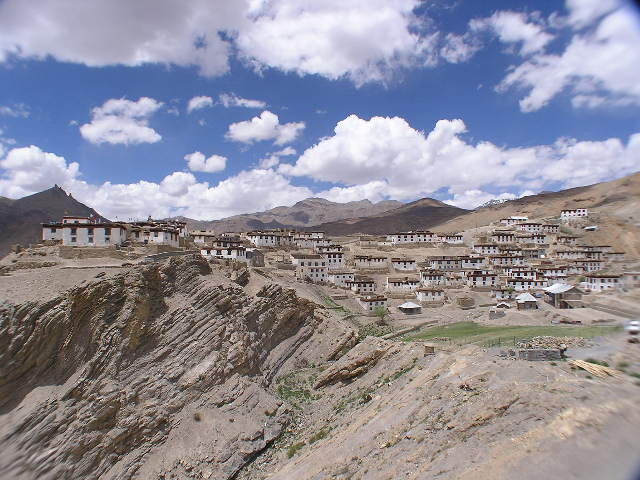 Past Ki Gompa (monastery) perched on a rocky knoll petruding from the hill. It's mightily impressive but I'm not really caring for monasteries on this trip so push on. I'm pleasently suprised on reaching Kibber to find a pleasant traditional village facing me in what looks like an ampitheatre. It looks like a poor village, but on close inspection most of the houses have satalite dishes and theres talk of flat screen tv's in some! I stay in a newish bright yellow hotel with chill out balcony. I stay a day and go for an acclimitisation ride, crossing a deep dry gorge to a nearby village. From my hotel I can see what looks like an awesome track that looks easily rideable but it turns out to be a deeply rutted tractor track. I carry the bike and ride a little until the clouds roll in. I eat some 2 minute noodles and decide to head back as it looks like rain coming. I fly down the track and can see a crowd of farm workers standing in the distance checking out my downhill skills. Luckily I don't face plant and make a fool of myself. I pass them at 40kmph....carrying on down a track I spied coming up. I love it! A pass into the gorge and onto some cool single track, the villagers still watching from the distance. It's probaly the first time they've seen a mountain bike here!? 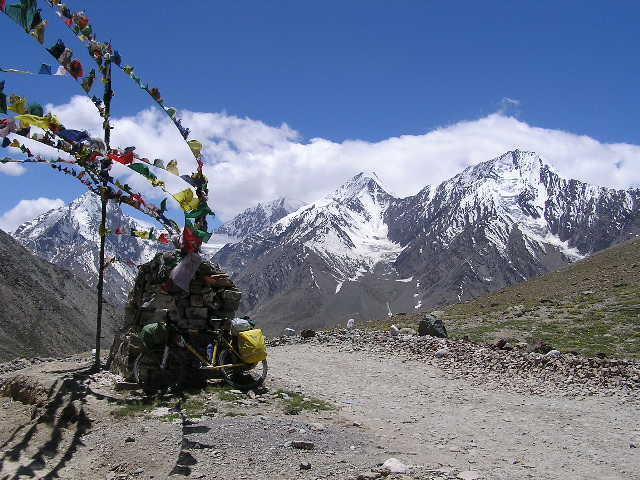 Head off upto Losar at the base of the Kunzum La pass. I'm excited at the prospect of my first big pass. Again the scenery is awesome but the road has deteriated into a 4wd rocky track. On leaving the restaurant I spy England on tv in the Euro Cup the and watch as Rooney scores a few blinders. Start the 17km climb up the Kunzum. I kick myself as 4km from Losar is a most incredible and peaceful camping spot with 360 degree mountain views. I carry on in high spirits singing 'there's only one Wayne Rooney'. The weather is perfect and I admire the scenery as I climb more switchbacks. Foreign tourists pass by in their jeeps and give me the thumbs up. The Indians stop for a chat and I get interviwed on a cine camera. Easily made it to find fine views and a roaring headwind for the waiting downhill.